Your Kids Will Be THRILLED By This Freebie & So Will You! Home Free Stuff Parents: Your Kids Will Be THRILLED By This Freebie & So Will You! Parents: Your Kids Will Be THRILLED By This Freebie & So Will You! Do your children enjoy eating and playing at Chuck E Cheese? If so, you have to check this great offer to get 50 FREE Chuck E Cheese tokens. In order to get the FREE tokens, your child must sign an anti-bullying pledge that you can find on the Chuck E Cheese company website. As part of the pledge, your child agrees not to bully anyone. Take the signed and completed pledge to your local Chuck E Cheese and your child will be awarded 50 tokens. The pledge must be printed out and given to a Chuck E Cheese employee in order to receive the free tokens. This freebie offer comes just in time for Columbus Day! Perhaps you can use your child’s day off school to take a fun trip to Chuck E Cheese. These FREE tokens can be redeemed for a special prize in the Chuck E Cheese prize case. Your child can pick a prize based on the number of tokens they have. This special freebie offer will probably not stick around for long, so be sure to take advantage of it while you still can! 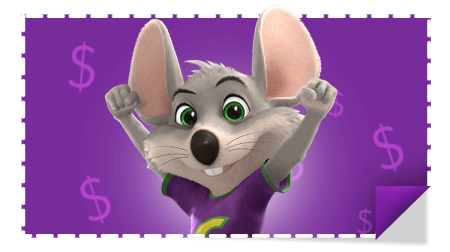 Be sure to check back for more special savings opportunities and deals from Chuck E Cheese.